From one of us(! ): Those special elections? They’ve cost the political parties at least $48.5 million. Bloomberg rounds up the red-state Democrats’ very impressive fundraising numbers. CA-SEN: A little-known Republican running on an “America First” platform could threaten Kevin de Leon’s second place status in the race. CA-GOV: Newsom’s lead is growing, but two Republicans are vying for second place as Villaraigosa’s place in the polls drops. 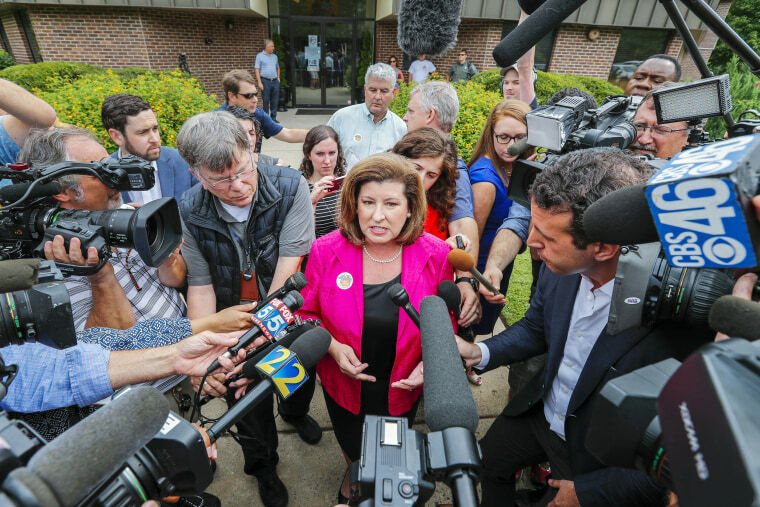 GA-GOV: Stacey Abrams is $200,000 in debt. OH-GOV: Richard Cordray is up with his second TV ad, tying himself to Barack Obama. MA-GOV: Setti Warren is dropping out of the Massachusetts governors’ race. MO-GOV: The Post-Dispatch rounds up Eric Greitens’ efforts to lobby lawmakers as impeachment looms. RI-SEN: Lincoln Chafee says he’s “very likely” to primary Sheldon Whitehouse. SC-GOV: Trump is taking center stage in ads in the South Carolina governor race. TX: Greg Abbott wants Blake Farenthold to pay for the special election to replace him. WV-SEN: The Morrisey campaign is circulating an internal poll showing him in the lead, 28 percent to 26 percent. VA nominee Ronny Jackson is out, NBC reports. French President Emanuel Macron says Trump is likely to scrap the Iran deal. Ben Carson will propose rent hikes for low-income Americans receiving federal housing subsidies. Justices appeared to be skeptical of a challenge to the president’s travel ban, writes the New York Times. Michael Cohen says he’ll take the fifth. Rudy Giuliani met with the special counsel’s office this week, the New York Times writes.